Bond Clinic Urologist, Dr. Kevin Lee elected president of Florida Urological Society (FUS) - Bond Clinic, P.A. Bond Clinic, P.A. 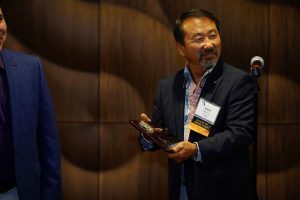 Dr. Kevin Lee accepts plaque as the 2018 Florida Urological Society President. Winter Haven, FLA – On August 30, 2018 The Florida Urological Society gathered for their 70th Annual Meeting at the Saddlebrook Resort in Wesley Chapel, Florida. The society, comprised of 600 Florida based Urologists voted to elect Kevin Lee, MD, FACS as their 2018-2019 President. Dr. Lee has been involved with the FUS for many years serving in different capacities. When asked about being elected as president, Dr. Lee stated, “It is an honor and privilege to serve and represent the urologic community in Florida. We as the Florida Urological Society work to improve the quality of patient care in our state through scientific sessions and are true advocates for our patients in the state and in national arena regarding urological care.” As President, Dr. Lee will oversee all the functions of the society and will be responsible for facilitating the annual meeting alongside the scientific chair. Dr. Lee began his practice of urology in 1991 after attending the University of Alabama for his Medical Degree, General Surgery Residency and Urology Residency. He is a diplomat of the American Board of Urology, a fellow of American college of Surgeons and was newly elected as the Southeastern Representative of the American Association of Clinical Urologist. Dr. Lee joined Bond Clinic in 2015 and has been a great asset to the Urology Department.